In recent years, modular building construction has increased in popularity. Factory-built buildings have become more sophisticated due in large part to client demand for buildings that are more design-oriented than the original ‘cookie-cutter’ buildings of years past. Flexibility and ease of location - Whether upsizing or downsizing, modular buildings can be added or removed to accommodate your needs. Modular buildings can be built as either single or multi-story structures that include elevators and stairways. Modular buildings are also easy to relocate, reinstall and renovate to meet your changing space requirements. Enhanced visual aesthetics - Modular building technology offers the same architectural and design elements used in traditional site construction. Buildings can be designed and constructed to match existing surroundings and facilities so they blend with the environment. Of course you can also custom design the building for a unique look. Value - Because modular buildings are built in factories they benefit from the process of assembly line production. Typically factories buy large quantities of various supplies to keep their costs lower. Labor is used with maximum efficiency, with skilled craftsman moving between workstations on the factory floor. Quality - Modular buildings are built in a modern, controlled environment and are precision engineered for a lifetime of trouble-free structural durability. 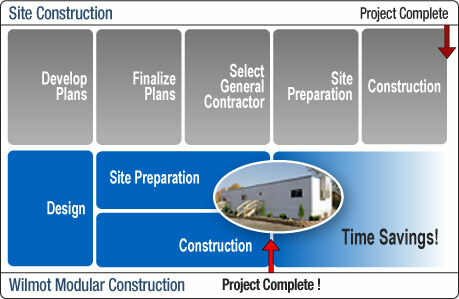 Quality control is maintained by constant inspection throughout the construction process. Financing options - Our sales team is committed to work with you to determine the best financing solution to meet your needs. We offer a full range of financing, including building and site preparation, all of which can be tailored to meet your budgetary needs.